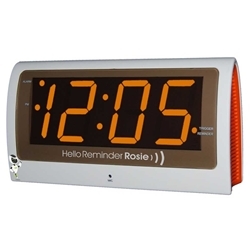 Reminder Rosie is a voice controlled reminder clock with battery backup that's so easy to use, seniors actually use her. The clock plugs into the wall outlet for power, but battery backup (3 AAA batteries not included) retains the clock time and alarm settings even during a power outage. Rosie provides a simple, 100% hands free solution that helps you remember your medication, appointments, bill payments, tasks, etc. - without touching any buttons! The familiar-looking LED clock records personalized voice reminders that announce at ANY Time, in ANY language. Loud alarm and large display. So simple to use for the elderly, they actually enjoy her! Voice activated clock that can be programmed to remind the user of appointments, medication, etc. Record up to 25 personal reminders. Large 2" LED digital numbers. Battery backup retains reminders, alarm and time/date.